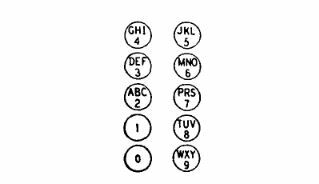 John T. asks Why do keyboard keypads number 7,8,9 on down and phone keypads number 1,2,3 on down? 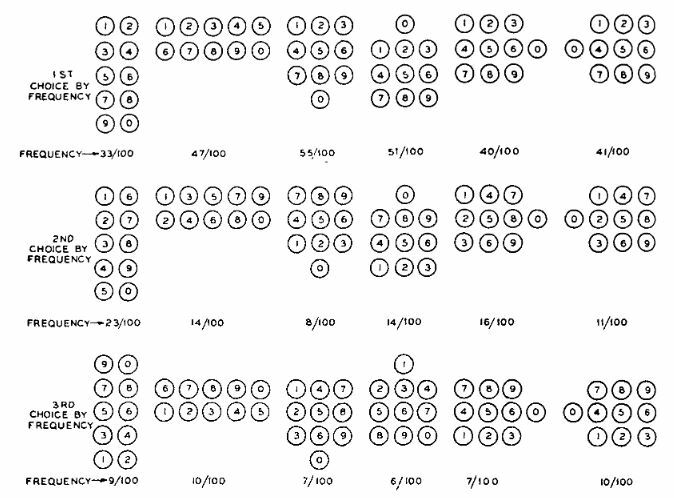 It’s not clear why numbering pads designed for calculation have 7-8-9 at the top, although the practice of placing the larger numbers above the smaller can be seen as far back as the late 19th century on early mechanical cash registers, often in this case with rows numbering vertically with 9 at the top and 0 at the bottom, and later morphing into the more traditional keypad we see today. Quickly becoming standard, when companies like Sharp, Canon, Sanyo and Texas Instruments began making electronic calculators in the 1960s, they simply retained the convention. In fact, there is no record of any of these companies making the first desktop calculators actually doing any studies to determine if this type of layout was optimal for users. The standard phone keypad layout is an entirely different story. Before push button phone systems found their way into the home of the consumer, a version of this existed for phone operators, with a popular form being two vertical rows of five buttons with the numbers and alphabet laid out in a curious fashion, as picture to the right. 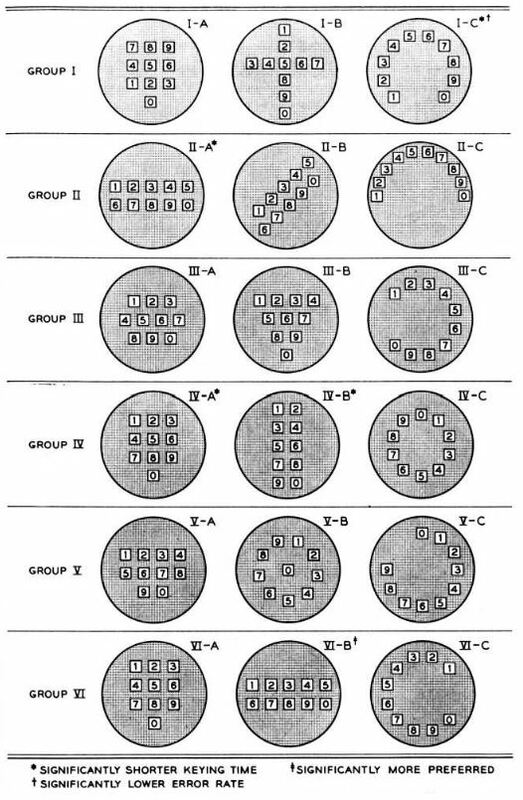 How this particular configuration was developed isn’t known, but whether or not this was really an optimal layout was something later studied, for instance in the paper Expected Locations of Digits and Letters on Ten-Button Keysets, published in a 1955 edition of The Journal of Applied Psychology. 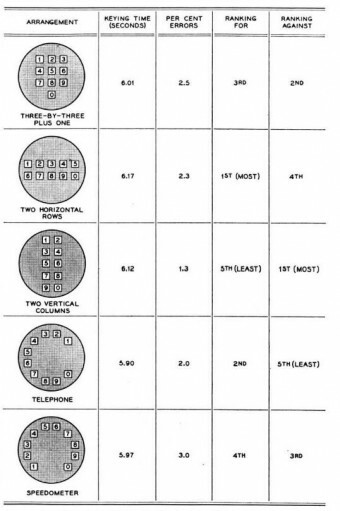 Of note here is also that the now standard 3×3+1 phone keypad layout resulted in a whopping 55% of those tested filling it out exactly as the phone keypad is laid out today while only 8% of the subjects filled out that pattern in the way calculators and non-phone keypads are traditionally laid out. It was not, however, this particular study that influenced the layout of the phone keypad. Rather, this was the result of research performed by the engineers at Bell Laboratories, who more or less came up with the same results when in the early stages of the design of the push button phone. Hoping to find the ideal arrangement in terms of speed, accuracy, preference and business considerations, in 1960 the engineers studied 18 different configurations they deemed most efficient. Randomly choosing 10-15 of their co-workers for each of a series of studies, the engineers had their subjects test one or two characteristics at a time (generally over a 3-5 day period), and these included aspects such as “keying time,” “errors” and preference. Notably, one of their first realizations was that, much like had been revealed in the aforementioned Applied Psychology study, “the arrangement frequently found in ten-key adding machines [7-8-9 at the top] . . . was not the best” for keying phone numbers in its comparison group, although that “geometric configuration with a different numbering scheme [1-2-3 at the top] . . . was superior in keying performance” in its group. Next they compared those configurations that were found to be superior within their groups in terms of speed and preference with a keypad arranged in the same manner as a rotary dial (counterclockwise with “1” at the upper right). Those that were compared in this round were a “speedometer” configuration (clockwise with “1” at the lower left), a two horizontal column arrangement and a two vertical column set-up, as well as today’s “three-by-three plus one” keypad. The test subjects’ favorite configuration was the two horizontal rows (in consecutive order with “1” at the top left and “0” at the lower right), the second most popular was the “telephone” (or rotary) style and the configuration we enjoy today was the study participant’s third favorite. However, as “two of the rectangular arrangements . . . offered certain engineering advantages,” these were the two the scientists continued to work with, and they experimented with the size of the buttons and spacing between them. After several more tests, they found that the arrangement with the lowest error rate was the “three-by-three plus one” configuration. Although not explicitly listed as a consideration in the 1960 study, since letters also had to be displayed, and they were always in an alphabetical order, it must have also just made sense to the scientists to keep the “1-2-3” (with its “ABC” and “DEF”) at the top. And, indeed, the previous 1955 study also found that “With numbers already on the keyset: a) People expect to find the letters arranged in horizontal rows, beginning with the top row, for those patterns in which the numbers are arranged that way…” They also found that even when the numbering system did not begin in the top row, about half the subjects in their study still preferred that the lettering pattern begin at the top and proceed horizontally across the rows. Who Invented the QWERTY Keyboard? Are You Really Entitled to a Phone Call When Arrested? Telephones used to need letters because phone numbers began with two letters, designating an exchange, and then seven numbers. Each exchange (think: switchboard) could service about 10,000 telephones. Today, the letters have been replaced by area codes, and the system is administered by the North American Numbering Plan Administration (NANPA). Each area code has 792 possible prefixes within it (because no prefix begins with 0 or 1), and for each prefix,10,000 numbers may be assigned; therefore, once an area code approaches 7.92 million numbers, a new one must be assigned. It’s not clear why “1” had no corresponding letters. It could perhaps be simply symmetry, since often “0” also had no letters, and on a rotary dial phone, they were situated at opposite ends. Although in 1996 more than 96% of U.S. households had a landline, by 2013, only 60% did. Why Did Old Phone Numbers Start with Letters? In Bonus Fact #2, it says “Today, the numbers have been replaced by area codes”. Does this refer to the two-letter exchange code described in Bonus Fact #1? If so, should it say “Today, the letters have been replaced by area codes”? As far as calculators, they started as adding machines and the original commercial design (1887 – https://en.wikipedia.org/wiki/Comptometer) used columns of keys, numbered from 1, at the bottom, to 9, at the top. A zero wasn’t needed because each column represented a power of ten (right to left – ones, tens, hundreds, etc.) and zeros didn’t affect the calculation (a basic abacus has nine beads per column – if you don’t move any of them, that’s zero). Later, a zero key was added to the bottom of each column (probably for users who didn’t RTFM). The key was at the bottom because zero and one are the most common values for most things that were being added up (in the days before $x.99 pricing). When they went to a ten key design, zero was a large, often L shaped key at the bottom which you hit with your thumb while the other n umber keys were hit with your first three fingers and the + – = keys were hit with your little finger (as I was trained in high school bookkeeping in the mid=60s). As far as phones, they did not have a zero to start with, they had a ten which was labeled O for operator and the dial went from 1 to O. 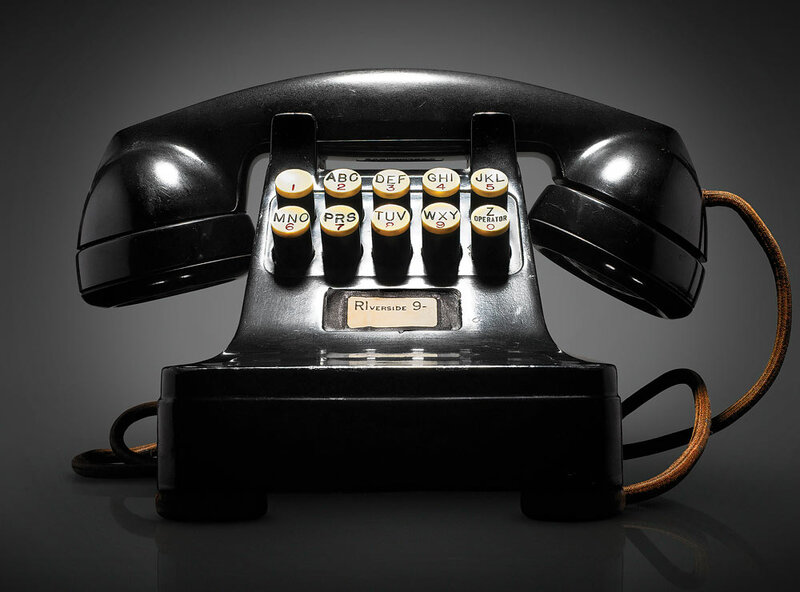 As phone numbers became longer, it was referred to as a zero, but it wasn’t. Before all electronic switches, a phone would send pulses to the mechanical switch to indicate the number dialed and when you dialed zero it would send ten pulses (because zero pulses wouldn’t mean anything). If you’ve ever seen an old movie where someone picked up a phone and started hitting the button under the handset to reach an operator, that worked. 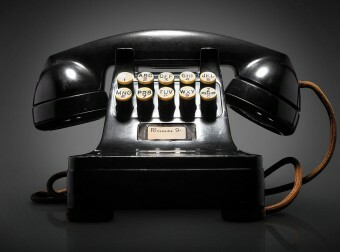 Each time you hit the button, it sent a pulse; ten pulses to start a phone call would connect you to an operator; and it was much more dramatic than dialing zero and waiting for the phone to send the pulses. That’s the history lesson for today. So as not to mess up my history lesson, I’ll do corrections here. Phone numbers did used to have an alphabetic exchange but it was followed by 5 not 7 numbers. It was only good for local calls. If you wanted to dial another city, you called the operator, told her the city and number, and she connected you. As Chuck Berry sings on Promised Land: “Los Angeles give me Norfolk Virginia, TideWater four ten O nine” with TW4-1009 being the phone number (https://www.youtube.com/watch?v=Awi3zM1U6gE). Area codes did not replace the letters, they were added on the front of the number (which did not change). They were to facilitate direct long distance dialing but letters were still common in phone directories and in conversation (I still remember I grew up with a KEnmore exchange). Bonus bonus fact: The Prisoner (Google it, Buy it, Watch it, Be better for it) insists he is “not a number”. The show was shot in 1967, just after Britain introduced “all-figure dialling” (sic) to replace traditional exchange names. Coincidence? The HO in HOmestead represented two numbers (in this example, 46). In the late ’50s, I believe, the fifth number was added, thus HOmstead 7-4955. The alphabetic exchange also designated what part of the city you lived in. In Houston, HOmestead was assigned to the wealthier west side of town. The commercial areas downtown used JUstin, and CApitol. I still prefer the classic Triangle layout for phones. The reason for adding a zero to an Adding Machine was a far more obvious need than not having it there. To ZERO-OUT wrong entries. If you punched in 1068, but realized that you were wrong and the number was 1008, how would you correct this? There were two easy ways to label that key. “Clear Line” and the number Zero “0”. Which required less materials in terms of space & effort? The number Zero because zero is only one digit and it can reuse the same shape design as the other 9 keys. When you think about it, the answer is obvious. We lived in a small town on the Texas coast, which used the manual system with a switchboard until about 1963. A high school friend was one of the operators. We’d pick up our receiver (with no dial), and Margie would answer with “number pleeeze?”. My Dad’s parents lived in Brookline, Massachusetts, and placing a call to them was a bit of a project. We’d give the local operator the Brookline number (Longwood 6-1010). She would jack through to the Corpus Christi long-distance operator and then leave the line. The routing operator would say something like, “44 plus one plus 619 plus 566 plus 1010”. 44619 would give the Corpus Christi operator the local operator in Brookline who would then dial the balance of the number. Then came the dial telephones, and we dialed 110 to get the long-distance operator. There were person-to-person calls, which cost more, but which were not charged until the correct party came on the line. So the operator would say to the person on the other, “Long distance person-to-person for Mr. Jack Smith.” If the party was not there, there was no charge for the call.